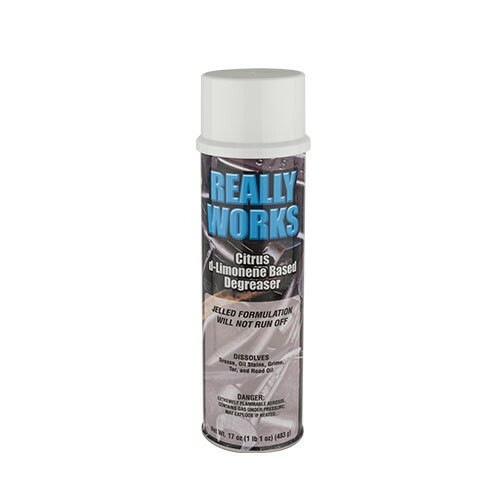 Really Works | Pro Chem, Inc.
REALLY WORKS is a jelled degreaser that removes tar, asphalt and grease from all types of vehicles equipment and masonry surfaces. It emulsifies tar, asphalt, bitumen and asphalt-based plastic cements and monoform roofing compounds. This product is safe to use on all water safe surfaces. It is effective on metal, concrete, brick, glass, most plastics, vinyl, Formica, Plexiglas, ceramic tile, terrazzo and sealed wood. SHAKE WELL BEFORE USING. Test in inconspicuous area to determine suitability. Spray REALLY WORKS directly on soiled surface. Allow a few seconds to penetrate. Agitate for tougher jobs. Wipe clean with damp, cloth or sponge or rinse with water. Reapply for extra tough jobs.